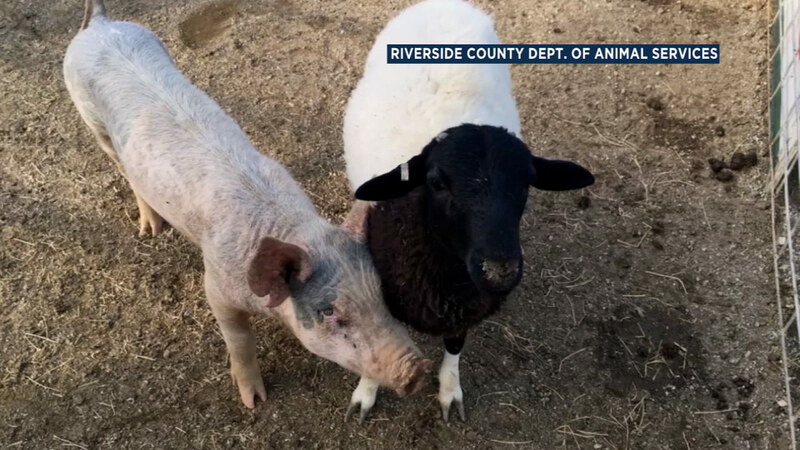 RIVERSIDE, CA -- A pig and sheep being cared for at a Riverside County animal shelter share an incredible bond. Workers at the Riverside County Department of Animal Services said the barn buddies are best friends as they enjoy to snuggle together in their pen. A Riverside County Animal Control officer picked up the pair on Monday after a woman spotted them together on her property in Jurupa Valley. The officer noticed that the two seemed to know each other very well, so he placed them in the same pen inside the shelter's barn area. The 1-year-old pig and 2-year-old sheep have been inseparable since. The Riverside County Animal Shelter hopes the owner of the duo will come forward before their two-week hold period expires. After that, officials said they would attempt to re-home the best friends together.